What is the best Treehouse of Horror short? Last weekend, The Simpsons has their annual Treehouse of Horror episode. I’ll write a review on that next week, but I’d like to ask to any other Simpsons fan out there what do you think is the best Treehouse of Horror short. My answer is and shall forever remain “The Shinning,” a parody of The Shining. Stanley Kubrick actually was big fan of The Simpsons and no show has better referenced the director’s work. In the episode, Homer goes insane not by ghostly spirits as in the movie but with no beer and TV. “The Shinning” is a perfect homage to Kubrick’s work and respects the director. It may just be the best thing The Simpsons has ever produced. Can’t disagree with you on that one. I’m generally not a fan of the Treehouse of Horror episodes but that one is brilliant. I don’t think anything has made me laugh more than The Shinning. I feel that The Simpson’s Treehouse of Horror episodes have fallen in the past ten years because they started just doing the exact same plots as what they were parodying rather than changing a major plot point like for The Shinning. Thanks for commenting. I didn’t know there was a Shining parody…I’ll have to check it out. My pick for the most memorable is from the second season (when THOH first premiered): the parody of “The Raven” with “eat my shorts” instead of “nevermore”. You definitely have to see it. It’s in Treehouse of Horror V in season 6. The episode also has my second favorite Treehouse of Horror short where Homer invents a toaster that can travel through time. I haven’t seen The Raven parody in a long time, but it’s one of my favorites as well. Thanks for commenting. I’ve never been a fan of The Simpsons, but I did see that parody of ‘The Shining’ and really liked it. I think that might have been one of the first episodes I saw of The Simpsons and soon afterwards I became an enormous fan. Thanks for commenting. I love that moment so much. Thanks for commenting. Ooh, I do love “The Shinning”. One of my favorites is “Living Doll” where the Krusty doll comes to life. I don’t know why, but I always go back to that one. Basically, all the ones based on Twilight Zone episodes are ones I love. Living Doll is one of my favorites. The best part is when they discover that Krusty’s switch was on evil instead of good. All the Twilight Zone segments are pretty good so it’s hard for me to pick a favorite, though “Hungry are the Damned” might take it. Thanks for commenting. Great post, I would have to go with the Shining, such a good one. Thanks! 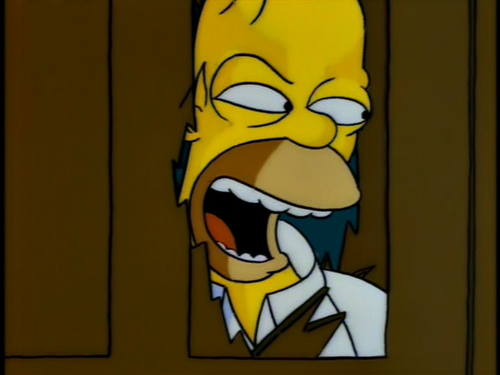 The Shinning really represents The Simpsons at its best. I’ve watched it about 8 times and it’s just as funny each viewing. Actually Dude, You And I Are 102% On The Same Page. “The Shinning” Is My Fave Fave Of All-Time. Actually, It’s My Favorite Simpsons Anything Of All-Time. I Laughed ’til I Cried The First Time I Saw It, And It Makes Me Giggle Like An Idiot To This Very Day. Thanks! I’ve watched it so many times and I laugh as hard each viewing. It’s hard for me to pick the best moment of The Simpsons, but this may be it.